Leandro reports on the Mirage 2000 entry into service with the Brazilian Air Force. Designated F-2000B/C by the FAB, these ex-AdlA fighters replaced the Mirage III last year. Featuring 100 photos of the aircraft and its pilots, including air-to-air shots! 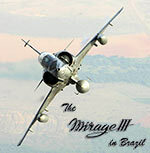 Article on the Mirage III in Brazilian Air Force (FAB) service looking back at 33 years and 67000 flight hours. Features air-to-air photos. Article on the 2º CORPAer of the Military Police of Minas Gerais, Brazil, with photos of the AS 350B2 helicopter. Walk-around of the Dassault Mirage III operated by the 1°GDA Jaguares of the Brazilian Air Force. Photo report of the ceremony held to celebrate the Brazilian Air Force's 65.000 flying hours with the Mirage III.